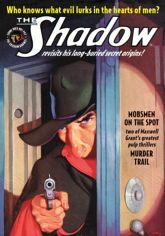 First, as rackets take over New York, The Shadow recruits wrongly convicted ex-con Cliff Marsland to put "Mobsmen on the Spot." Then, the Master of Darkness and Marsland follow a "Murder Trail" of stolen millions to unmask a hidden mastermind! BONUS: A Nick Carter illustrated thriller by Bob Powell from the Golden Age of Comics! This instant collector's item showcases the classic color pulp covers by George Rozen, the original interior illustrations by Tom Lovell, and historical commentary by popular culture historian Will Murray.